I have been an avid hiker/outdoors person from a young age. I have hiked throughout the high peaks in the Adirondacks, the presidential range in New Hampshire, and a number of other mountains in Vermont and New Hampshire on many occasions over the years, all seasons. I also canoe and trail run fairly regularly. 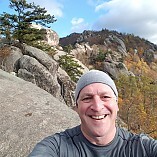 I currently live in Maryland and hike either by the Potomac River on local trails, on small nearby mountains, or in Shenendoah National Park and surrounding areas. I try to take at least one winter backpacking trip annually, so I have a fair amount of experience with snowshoes, crampons, and other winter gear, including large, heavy backpacks and clothing suitable for sub-zero, highly windy conditions. I have also hiked and camped on occasion in Northern California, the Arabian Gulf, Asia, Central America, and Eastern Europe. During college, I spent two summers leading teenagers on hiking/backpacking, cycling, and canoe trips in and around the Adirondacks.